Over the last several years many creative, innovative and passionate people have supported the Save Kananaskis campaign. Now, some have moved to B.C. others have refocused on activities and interests they find more rewarding. It is difficult to continue to advocate for change when it appears that none is possible. The disenfranchisement of those who have positive contributions to make to our society is a deficit that will never show up on a bottom line. But it will be reflected in the quality of life in Alberta and it will appear in the character of our communities. Tilting at windmills is wasted effort, no matter if the cause is just. We've learned, as did Don Quixote, that fighting otherwise-unwinnable battles is a fruitless task. It takes a toll. Neverthe less, comments will be posted on this site from time-to-time as policies that affect how Kananaskis is managed are released. Inevitably North-eastern Kananaskis will become a park, it is too valuable to too many people not too. Once the greed and self interest of those who have won power has been fulfilled. Once they find a need to recognize one of their own, they will designate the park to the memory of some venerable leader. Of course, by then the pristine natural area will be scarred for generations to come. We'll celebrate the lack of vision and misguided priorities of those who we trust to be good stewards of the land. 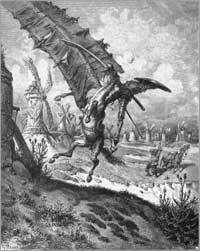 Illustration for Miguel de Cervantes’s “Don Quixote“ by Gustave Doré, 1863.